9.4% scored Smaller Government Centrist out of 60410 total takers for the new Version 7. 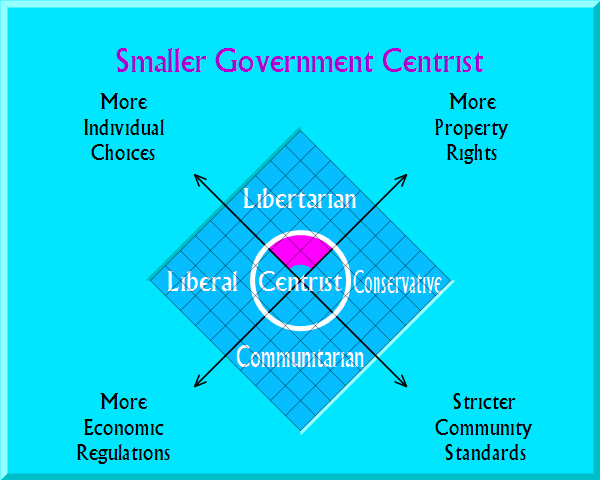 11.3% scored Smaller Government Centrist out of 302551 total takers for the old Version 6. You want the government a bit smaller overall than what we have not, but not a whole lot smaller. Usually you could get what you want with a nearly equal mix of Democrats and Republican, if they are the correct Democrats and Republicans. A random selection of each leads to bigger government. Be choosy. Or you could add a few Libertarians to that equal mix of Democrats and Republicans. The era of Big Government is Back, and it has an attitude! At least that's the theme of the two major parties. Sad news for smaller government centrists. But there is some possible good news for you: the Libertarian Party has also nominated a bigger government ticket than is their habit. Instead of nominating a pair of borderline anarchists, the Libertarians have nominated a pair of former blue state Republican governors. So do check out the campaign web site and watch some of the interviews. Spread the word if you like what you see. Gary Johnson has a small but significant probably of winning. But it is going to require active word of mouth to get from 10% in the polls to the 15% needed to get in the debates. And for some less extreme visions of smaller government, see the social liberal and conservative utopias as well. Here are some sites that offer some creative ways to cut excess government while protecting and even extending the values that big government currently serves. media. Would you like to fire a hundred thousand bureaucrats? Would you like to restore federalism and bring most domestic government back down to the state level? Then replace the welfare state with free money for all U.S. citizens.